Our debut album is all about taking a look at the familiar in a new light, a process of reflection. As we approached the 10 year milestone as an ensemble, we found ourselves looking back over the last decade for inspiration. One obvious pillar of our artistic identity has been Joseph Haydn, whose quartets we have performed in every season without fail since the very beginning. And what better place to begin? The C Major Quartet, Op.54 No.2 has become one of our favourites in recent seasons, particularly because, after having already written 41 quartets, Haydn somehow manages to produce a work of sheer brilliance and utter beauty, still toying with the conventions and expectations he himself established for the genre. Ravel’s String Quartet in F Major has been my favourite quartet since the first time I heard it at a summer music camp as a young teenager, and it’s the piece that motivated me to dedicate my life to string quartets. My colleagues and I all agreed that this work had to be on the album, but how would we relate it to Haydn, who had been dead almost a century before Ravel even conceived of his singular quartet? One of the pioneering Neo-Classicists of the early 20th Century, Ravel was constantly reaching back through time and bringing old forms into new light. The quartet itself can even be seen as a reflection upon itself, with thematic material from the first movement appearing throughout the whole work, recast in different light, time, and space. I have always lamented the fact that Ravel only wrote one string quartet, so I began looking through his piano music to see if there were any pieces I could arrange for the quartet. It didn’t take me long to find the elegiac Menuet sur le nom d’Haydn, a short piano piece Ravel composed in homage to Haydn on the centenary of his death in 1809. I found that his Menuet antique, which the composer had later orchestrated himself, worked well as a quartet, as did the diminutive Menuet in C-sharp minor, published posthumously. How did we make the leap to Stravinsky? His friendship with Ravel and shared Neo-Classical spirit bring their musical kinship to life. But while Ravel seems to delight in the seamless interweaving of past and present, Stravinsky rips the old styles from their ancient roots and thrusts them vigorously into the modern era with a vitality akin to Haydn – just another reminder that there is always more than one view of history. So rather than starting at the beginning, we find ourselves at the turn of the 20th Century with Ravel’s String Quartet, reflecting on a genre that has been perhaps the most intimate and personal for all composers since Haydn’s time. As the minuets weave their way through the album, the lines between past and present blur, creating a new time and space to enjoy these wonderful works. When Ravel composed his String Quartet, between 1902 and 1903, he was particularly influenced by Debussy’s quartet of 1893. Both pieces are indebted to Franck’s use of cyclical form, and both were described rather dismissively by the composer and teacher Vincent D’Indy as, “jolis morceaux pour quatuor à cordes” – “pretty pieces for string quartet”. Ravel later drew a distinction between the style of his quartet and that of Debussy’s, arguing that: “Stravinsky is often considered the leader of neoclassicism, but don’t forget that my String Quartet was already conceived in terms of four-part counterpoint, whereas Debussy’s Quartet is purely harmonic in conception”. Ravel entered the work for both the Prix de Rome and the Paris Conservatoire prize, but was rejected by both institutions. Even the quartet’s dedicatee, Gabriel Fauré, was scathing about the final movement, and the critic of the New York Tribune heard in the quartet, “as much emotional nuance as warms a problem in algebra”. Yet there were those who recognised the quartet’s qualities, among them Jean Marnold in Le Mercure de France: “… a spontaneous art or the unfailing nature of instinct ensures the communication of his thinking. One should remember the name of Maurice Ravel”. Debussy himself was amongst those who championed Ravel’s String Quartet, imploring: “in the name of the gods of music, and in my name too, do not change anything in your quartet”. Ravel seems to have heeded Debussy’s advice: in his so-called revision of 1910 he altered only two notes. The opening movement is characterised by a trademark Ravelian device, the pervasive interval of the falling fourth. There is an elegant main theme contrasted with more energetic triplets, and a tranquil coda. Above these structural anchor points one may also hear a rather playful, unpredictable succession of textures in which the instruments pair up in different combinations. The rich Scherzo boasts almost orchestral sonorities, with contrasts between pizzicato and bowed strings and between 6/8 and 3/4 time. There is a brief allusion to the opening bars of the first movement, showing the influence of Franck’s cyclical techniques. The dreamy slow movement features Romantic harmony, but structurally is forward-looking, with further cyclical treatment of the first movement’s opening phrases; these become an integral part of the slow movement’s material, appearing in new guises in the finale too. This final movement is a metrical tour de force replete with ostinato rhythms; Ravel creates a tussle between five and three beats in a bar, intensifying this contrast during the coda. In September 1909 Ravel “tailored” (his own expression) a minuet for a special edition of the Revue musicale celebrating Joseph Haydn’s centenary. Alongside other French composers of the day, Ravel was called upon to construct a piece around a five-note theme based on the letters of Haydn’s name (hence “tailored” rather than “composed”). Yet the result is no mere academic exercise: Ravel’s Menuet sur le nom d’Haydn (heard here in its transcription for quartet by the Tesla Quartet’s first violinist, Ross Snyder) is, for all its apparently restrictive parameters, a work of charm; a sincere tribute to a composer he genuinely admired. Rich, jazz-hued harmonies and graceful melodic lines pervade the work, and Ravel chose to accentuate not the five-note theme given to him as part of the commission, but a motif of his own devising, echoing the four syllables of “Joseph Haydn”. Haydn’s set of three quartets, Op.54, exhibited a new, more extroverted character compared with his previous quartet output, with the first violin especially enjoying gregarious, virtuosic writing. Haydn sold the set to Johann Tost, the hugely talented leader of the second violins in the Esterházy orchestra (of which Haydn was director), and a slightly dubious character who liked to concoct money-making schemes, including creating a black market for stolen copies of music. Haydn entrusted Tost with selling the works to a publisher in Paris, and in due course they were issued by the Parisian publishing house of Sieber in 1789 alongside their companion set of three, Op.55. Both sets were also performed to great success in London. There is speculation as to whether the first violin part was intended for Tost himself, or whether Haydn was thinking more of Parisian audiences, with their penchant for the quatuor brilliant featuring dazzling first violin writing. In any case, Haydn avoids empty show, balancing display with formal ease and dramatic depth. The second of the Op.54 quartets, in C, is the most famous of the three. The work opens with a sinewy yet spacious Vivace, in which virtuosity is a key element, underpinned by some astonishing harmonic shifts. Haydn draws upon gypsy folk music in the C-minor Adagio, the first violin’s lyrical, almost improvisatory line supported by a solemn chorale. The Menuetto returns us to C major, but with a rather diffident elegance, and C minor soon rears up again in the almost melodramatic Trio section (a nod to Haydn’s “Sturm und Drang” – “storm and stress” – period?) which parodies the Menuetto itself. 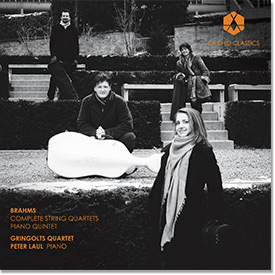 The quartet’s tensions are resolved in the innovative finale, which opens not with the quick-fire movement one would expect, but with a sublime, expansive Adagio in which both violin and cello are given the opportunity to sing melodies of angelic purity. The mood darkens, alluding to the contrasts heard earlier in the work before, at last, thePresto bursts forth, its energy and levity hard-earned. But Haydn has more surprises in store. The Presto is not conclusive, but merely an interlude, and we return to the Adagio material with which, in a gesture which must have seemed truly radical at the time, the piece ends. That Haydn achieves this delicate balance – distributing enough weight to the Adagio that it may fittingly conclude the whole work – is testament to his genius as a quartet composer. It is a moment of real wonderment: at once revolutionary and exquisite. Ravel’s Menuet antique was, along with the Habanera, one of his first published works, written for piano in 1895 and orchestrated by the composer in 1929. The minuet, with its roots in the Baroque suite, would become a movement to which Ravel would return and make his own in a number of guises, notably in Le Tombeau de Couperin. This early example owes much to Chabrier (whom Ravel admired enormously), especially in its harmonic richness. Stravinsky composed two small works for string quartet, one of which is the Concertino of 1920. In 1952 he augmented the scoring to produce the Concertino for 12 instruments. Arthur Lourié, a friend of Stravinsky’s during his Paris years, referred to the string quartet version of the Concertino as having “wind intonations”, which may in part have inspired the reimagining of the work. The string quartet version was premiered by the Flonzaley Quartet on 23 November 1920, at the Aeolian Hall, New York. Many will be familiar with the now-legendary audience response to the premiere of Stravinsky’s Rite of Spring (Paris, 1913), but it seems that the Concertino elicited a similarly strong reaction. One audience member observed that “… these sedate listeners actually burst out laughing in the brief pause before the final measures; and after all was over one faction tried to hush the applause with violent hissing, thus introducing a European custom for the first time into an American concert hall”. However, Richard Aldrich, writing in the New York Times, was more measured, stating that the quartet “is not programmatic, but ‘pure music’”, and a performance in Boston just over a year later was well received, anticipated by an article entitled: “Stravinsky’s Concertino for the First Time: That Debated and Berated Piece of Ultra-Modern Chamber-Music to be Played Here Tomorrow by the Flonzaley Quartet”. After the Boston concert, on 19 January 1922, the reviews were warm, bearing titles such as: “Flonzaleys in Superb Form” and “Stravinsky’s Concertino is Cordially Applauded”. The “ultra-modern” aspects of this miniature masterpiece may be heard in Stravinsky’s characteristically vigorous rhythmic units, tautly knit, which are balanced with moments of quirky melody, and with the sustained, hushed harmonies which return during the coda. Dating from 1904, Ravel’s tiny Menuet in C-sharp minor, again for piano but arranged for string quartet by Ross Snyder, was unpublished during Ravel’s lifetime. Ravel had taken on Maurice Delage as a private composition pupil; Delage had been inspired to start composing after hearing Debussy’s Pelléas et Mélisande in 1902. Ravel wrote this Menuet on the back of an exercise set for Delage, and his own insistence that pupils avoid “babillage” (musical verbosity) is demonstrated with almost miraculous brilliance. He creates a whole musical world – exuding a tender melancholy reminiscent of Mother Goose – in under a minute. These words are the inspiration behind the Tesla Quartet’s vision. For the quartet, music is the conduit for this incredible, binding force, these ties inseparable. Through performance, teaching, and outreach, the Tesla Quartet strives to tap into this palpable feeling and create meaningful connections with their audiences. Praised for their “superb capacity to find the inner heart of everything they play, regardless of era, style or technical demand” (The International Review of Music), the Tesla Quartet brings refinement and prowess to both new and established repertoire. 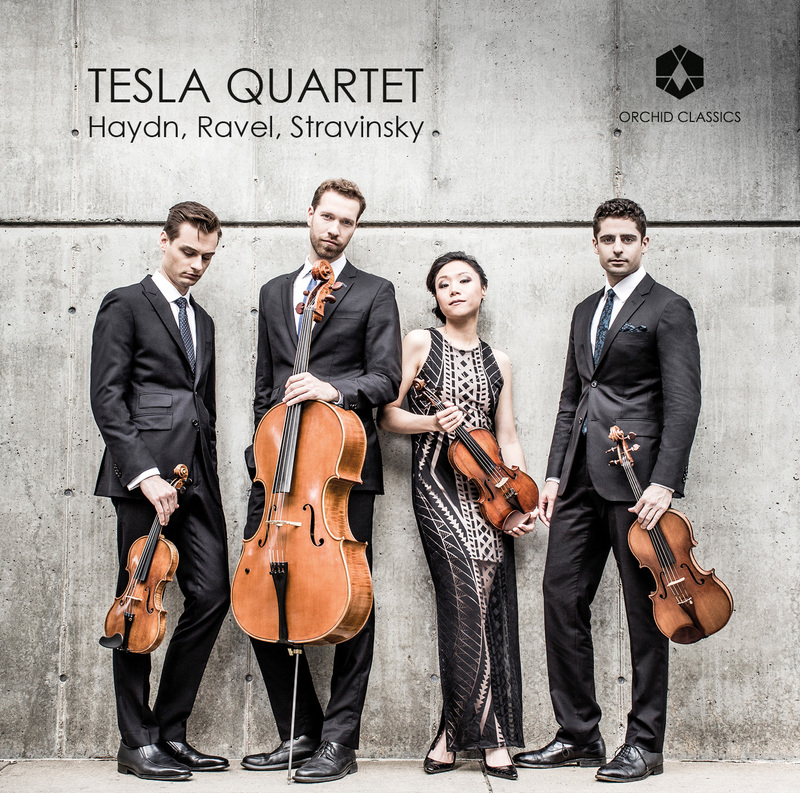 Dubbed “technically superb” by The Strad, the Tesla Quartet recently took Second Prize as well as the Haydn Prize and Canadian Commission Prize at the 12th Banff International String Quartet Competition. The quartet has also garnered top prizes at numerous other international competitions, including the Gold Medal at the 2012 Fischoff National Chamber Music Competition, Third Prize and the Best Interpretation of the Commissioned Work at the 6th International Joseph Haydn Chamber Music Competition in Vienna, and Third Prize at the 2012 London International String Quartet Competition. The London Evening Standard called their rendition of the Debussy Quartet “a subtly coloured performance that balanced confidently between intimacy and extraversion”. The quartet performs regularly across North America, with recent international appearances in Austria, Canada, China, Germany, Hungary, South Korea and the United Kingdom. Notable festival appearances include the 10th Joseph Haydn String Quartet Festival at the Esterházy Palace in Fertőd, Hungary, the Mecklenburg-Vorpommern Festival, and the Swannanoa Chamber Music Festival. 2018/2019 season highlights include performances at Stanford University’s Bing Concert Hall as winners of the prestigious John Lad Prize, a return to London’s Wigmore Hall, and debuts at New York’s Lincoln Center and the Banff Centre International String Quartet Festival. Since 2015 the Tesla Quartet has held a community residency with the Western Piedmont Symphony in Hickory, North Carolina, which includes performances and workshops at local colleges, universities, and in the public school system, as well as a dedicated chamber music series. The quartet also served as the Marjorie Young Bell String Quartet-in-Residence at Mount Allison University in New Brunswick, Canada, from 2016-2017.